As an ex-professional fisherman from Western Australia – 35 years in the crayfishing industry – I’ve experienced the best and worst the ocean can dish out. I’ve run many boats over the years, from a 60’ foam sandwich vessel through to 48’ and 65’ fibreglass West Coast designs, up until I sold out of the industry in 2000. In 2002 I went for a golfing holiday in Thailand. I moved here in 2004, met my wife Dang and have been here ever since. Thailand has some fantastic cruising waters and pretty good fishing as well. While Thailand has a lot of boats – big ones, small ones and a lot of rubbish – I went to YouTube to research the best boat I could find. This is where I came across the Bar Crusher 780HTP. Decades on the ocean has created a sharp eye for detail when it comes to boats – and Bar Crusher ticks all the boxes. 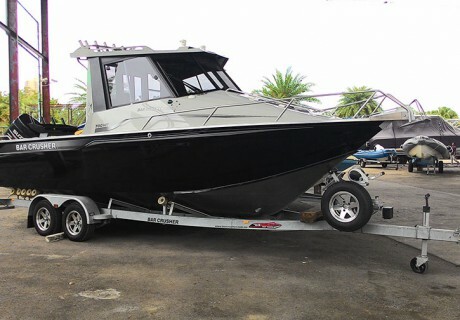 Exceptionally well built, very seaworthy, comfortable and efficient ride, and low maintenance. The importing process here was mind boggling with all the red tape and taxes, although only a Bar Crusher would do. We’ve just taken delivery of our new boat – named WAN (which is short for my wife’s name) – and we’re looking forward to many years cruising and fishing the waters around this amazing coastline!